History has shown us the devastating consequences of oil and gas accidents. It’s simple. Accidents have a direct impact on your bottom line. But we have the technology and resources to prevent them and protect your business. Committed to efficiency, continuous R&D and strong partnerships, SA Habitats provide a cost-effective, reliable and time-saving solution to protect your business for a safer future. Working closely with our clients, employees and suppliers, we embrace a collaborative philosophy for best results in our product performance and delivery. Your success IS our success, as demonstrated by our zero accidents track record. 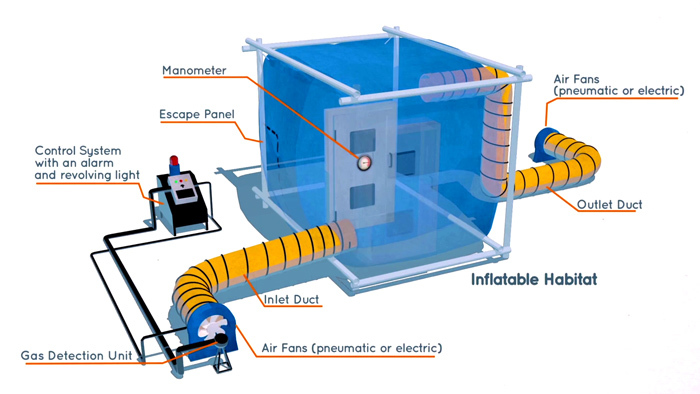 A habitat is simply a positive pressure enclosure (otherwise known as an isolation chamber) used to provide a safe work environment for performing hot work in the presence of explosive gases or vapours. Habitats are typically used in conjunction with welding work, often in association with the offshore oil industry. SA Habitats provides both electric and pneumatic habitat systems to cater for your requirements. The typical habitat setup is illustrated in the diagram below. In addition to our standard habitats, we also provide customised habitats for clients with special requirements. Customisations include different sizes, additional gas detectors and oxygen sensors for reinforced safety, and the option for 2-in-1 electric and pneumatic habitat systems.